Anti-Aging Therapy with Gerovital H3. After the age of 40, therapy with Gerovital H3, pills and injections, can be started. Gerovital H3 formula represents a proved method to hold back the aging process, an effective way to fight against and treat chronic degenerative diseases. *Management of the sexual life. To anticipate and restrain the chronic diseases of the seniority and to partially reverse the aging progress, a prophylactic therapy may start from the age of 40. General therapy for one year consists in 5 series of 25 pills with adequate breaks, after every course. This schedule may increase to 6 series for patients over 65 years. Before starting the therapy with injections, do the tests for allergy: first injection 1ml; after 24 hours, second injection 2ml. If no allergic reactions appear, the therapy may proceed. The reactions that may occur are: rash, itching, eruption, vertigo, headache, cephalic heating sensation or a metallic taste. In most cases, these body reactions show in patients over 80 years. Studies have revealed that the intolerance appear in 1 of 7000 cases. A healing and restorative therapy in degenerative chronic diseases involves a schedule of 6 cures of 12 injections and 5 cures of 24 pills during a year. Note: After injection, the patient school rest for 10-15 minutes. This drug should not be put in practice together with Physostigmine (also called Eserine) – a crystalline alkaloid used in medicine as a miotic and cholinergic agent and to enhance memory in patients with Alzheimer's disease. Also, it should not be combined with Prostigmin - a parasympathetic drug that acts as a reversible inhibitor to acetylcholinesterase, an enzyme which breaks down acetylcholine (ACh) in cholinergic nerve endings. It is used clinically to treat Myasthenia Gravis, Paralytic Ileus and Urine Retention. It is advisable not to apply Gerovital H3 in the same time with Sulphamides, because the interaction in the bacterial metabolism. Gerovital H3 therapy is not recommended in the following conditions: severe hepatic diseases; renal failure; severe arterial high blood pressure; febrile states. *Apply prudently in cases of epilepsy or high blood pressure. *Studies revealed no situation of drug addiction. *No evidence regarding human fetus risk. Drug intoxication develops over 400mg IV (intravenous) rapid injection. It manifests as convulsions, low blood pressure, coma. At this time apply treatment for any acute intoxication. No chronic intoxication occurred in clinical studies and practice. Nice article. 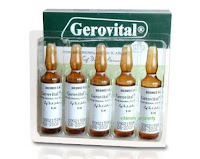 Gerovital is an anti aging and anti-depressant medicine that provides anti aging benefits to both mind and body. 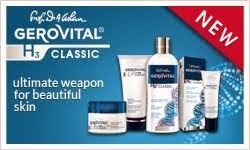 Gerovital is an effective anti aging treatment. Beside the anti aging benefits, it also beneficial to low cholesterol levels.